Make preparations before bringing the cat home. Cats learn about their environment via scent. Before you bring your cat home, give her a scent introduction. Swap scents by taking a t-shirt with your smell on it to her for her to use as bedding. 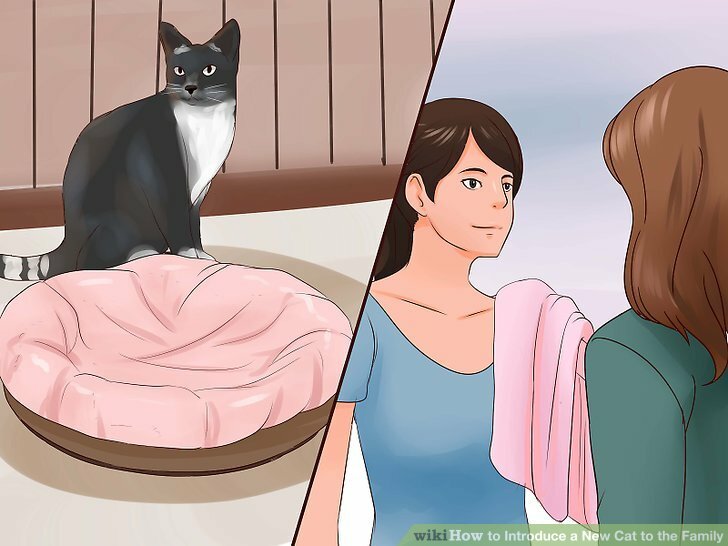 Likewise, take a blanket she already uses at the shelter and put it in the bed of your established cat. This machine gives off a synthetic version of a feline pheromone, which helps the cats feel secure and decreases stress levels. 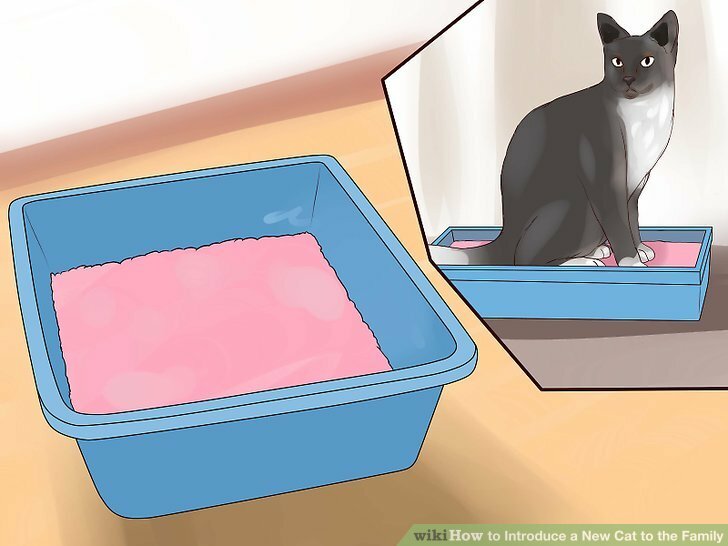 This helps to chill the established cats so they are more relaxed with any changes. Cats tend to like thinly granulated litter, so make sure to bring home litter that doesn’t overwhelm your cat with its scent or texture. Place her litter box in a quiet but accessible part of the safe room. This way, she will feel safe using it. Don’t punish the cat for not using the box. If your new cat thinks the carpet is a new bathroom, don’t put her face in the litter box or punish her by putting her in the box. This may make your cat even more reluctant to use the new box. Don’t let the cat out to roam. The wrong way to introduce a new cat is to let her roam right when you get her. Do not let her into the main house and let her explore. Not only will she feel overwhelmed and stressed, but your established pets will view her as invading their territory and are likely to chase her. This will compound and legitimize her distress and fear. Give the cat lots of love. 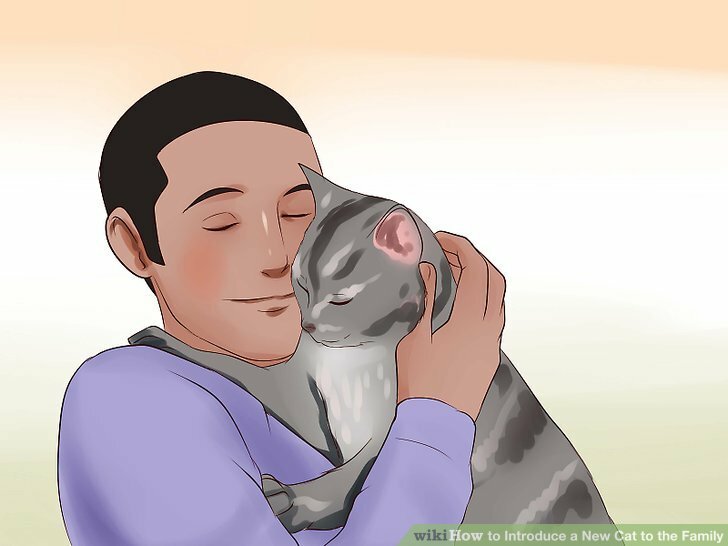 If you want to make your new cat feel at home, give her lots of love. Don’t constantly pet the cat, especially if she doesn’t like it. Instead, spend as much time in the safe room as possible. This will make her more comfortable and less anxious. Play with her as much as you can, whether you’re playing with a dangly toy or moving a laser pointer around the room. Just wait a few days before you start using interactive toys or she may be overwhelmed. 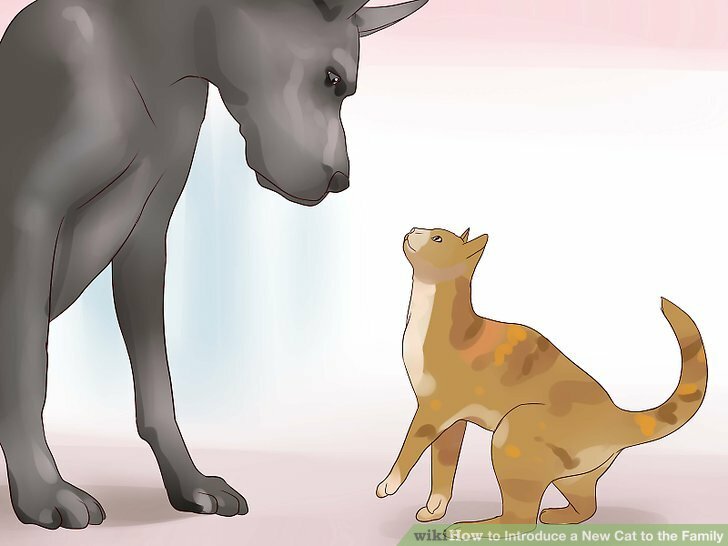 Judge how confident your new cat is. If she is hides often, give her plenty of time before offering to let her explore beyond the cat room. If she seems bold and is regularly waiting at the door, consider leaving the door ajar after a week so she can explore further. This time period can vary. 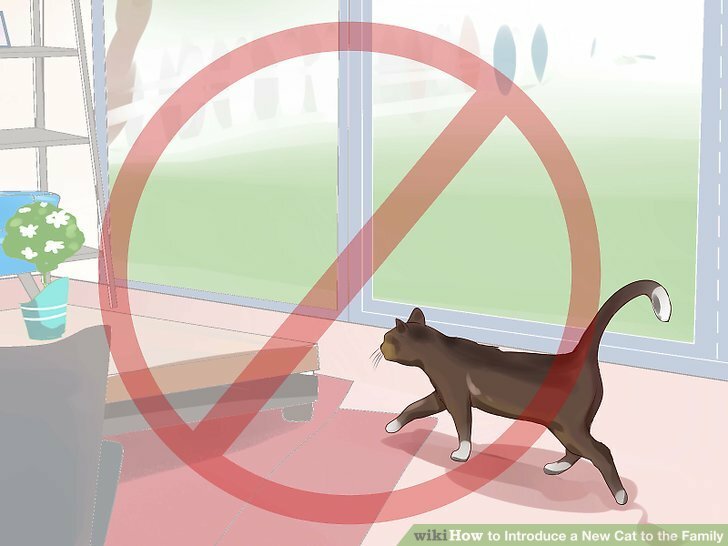 If your cat is rambunctious and clawing at the door after just a few days, you shouldn’t make her feel trapped in the one room and let her explore. On the other hand, if she still seems frightened by the new environment and has made no attempts to leave the room in over a week, give her more time to get adjusted. Avoid introductions during stressful times. 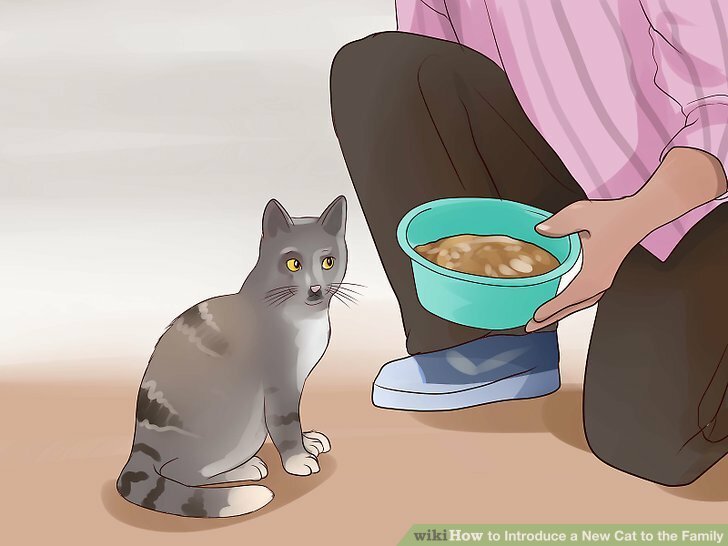 If you introduce your new cat to the family in the middle of a hectic time, such as the holiday season, she will be overwhelmed by the sounds and smells of the people and events. If you bring your new cat home when you’re too stressed out or too busy to spend time with her, she’ll feel very lonely. Help children understand the new cat. When you first get a new cat, explain to your children that she needs time and space to settle in. Let them visit the new cat under supervision and for short periods of time. 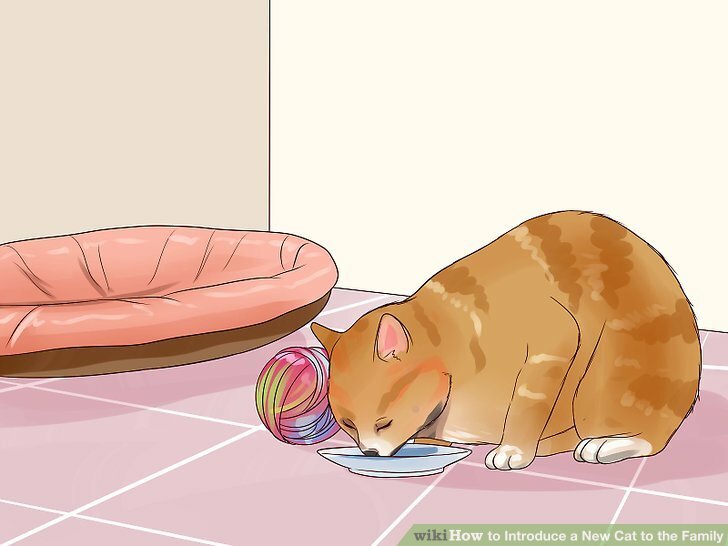 Give the children treats to place on the floor to offer her or else let them take in her food bowls. This will help the children feel part of the situation. Encourage them to be quiet and still in the cat’s room, sit on the floor, and be patient to see if the cat comes to them. Do not allow the children to pull the cat’s tail, ears, legs, or whiskers or mistreat her at all. Do not allow children to stare at the cat in her hiding place because she will feel threatened. 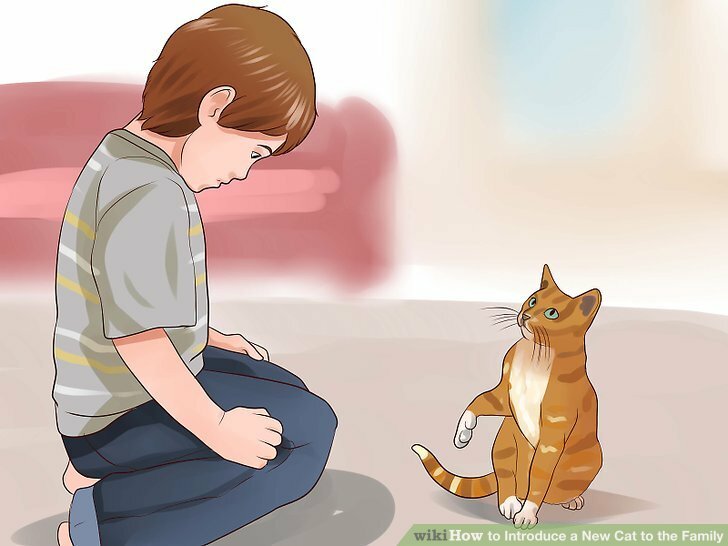 Also, teach the children to respect the cat’s body language. If she hisses, hunches up, or her eyes go big and black, she is afraid. If any child sees her do this, he should back off and make sure the cat has a clear, unblocked route to her hiding place. Get your cat acclimated to your family. First, bring in things from the rest of the house so she can get used to different smells and sights. Let her smell a pillow from the couch or a blanket from your guest room. Next, open the door and wait for cat to venture out on her own as she explores the sights and smells of the rest of the house. You should be around for this, but don’t distract her. If you’re not at home, put the new cat back into the safe room. Wait for her to feel completely comfortable with the rest of the house before you let her roam when you’re not around. Relocate her food and litter box. Once she gets used to the rest of the house, slowly move her food and litter box to the place you want to keep them permanently. Just make sure the cat knows where you move them, or she will be very anxious. For the first week, you should keep your new cat in her safe room and keep your other cat or cats in the rest of the house. Make sure the safe room isn’t a favorite room of your other cat, or he will try to go in the room and feel anxious when not allowed inside. Let the cats stay in their separate environments. They will slowly become accustomed to one another’s sounds and presences. Introduce the cats to each other’s smells. 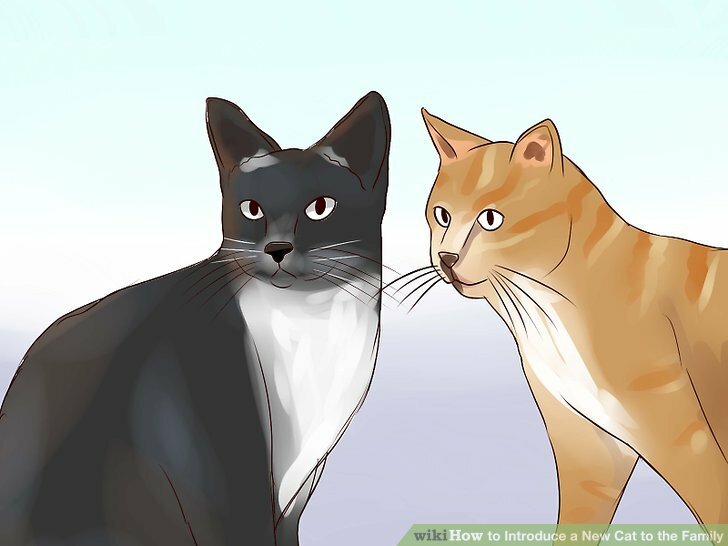 Let the cats get accustomed to each other’s smells before they officially meet. 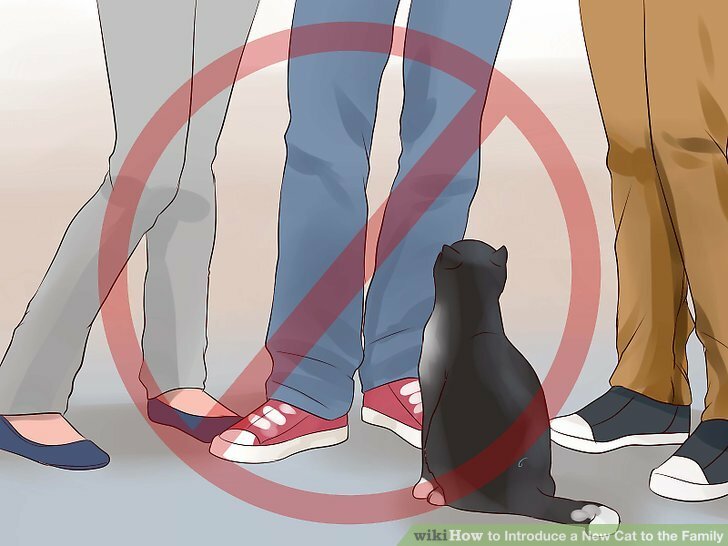 Start brushing them with the same brush, petting one cat and then petting another, or introducing one cat to the other cat’s favorite blanket or toy. 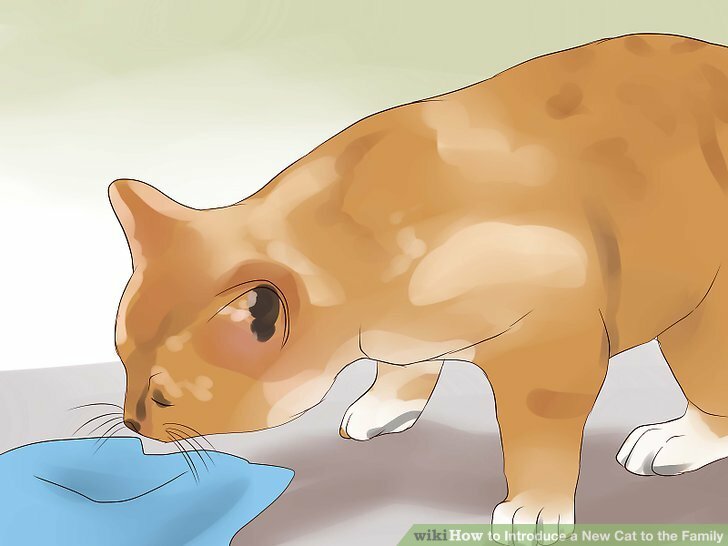 Rub a towel against the new cat’s scent glands on the cheek and give it to the old cats to investigate. Do the opposite thing with the old cat’s scent glands as well. 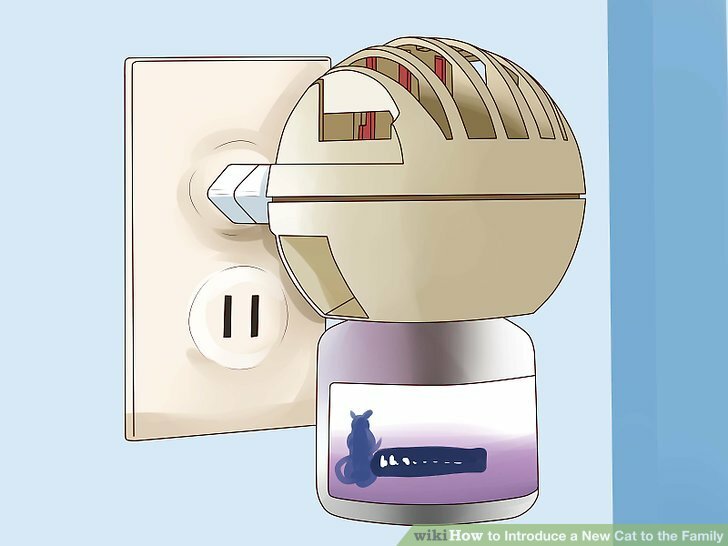 This will help your cats learn each other’s scent in concentrated form. Put the new cat in her carrier and take her to another room in the house. She will still need her room, so keep it as her territory for the time being. 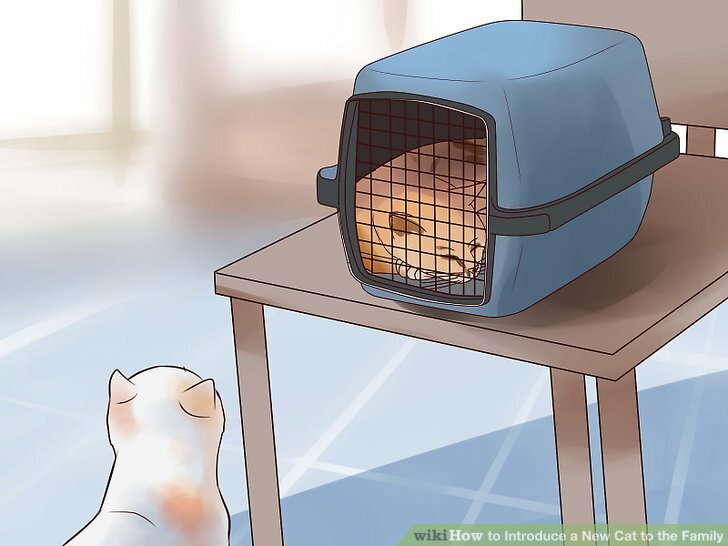 Place the carrier containing the new cat on a safe chair so the cats can sniff and explore the each other without them chasing each other or fighting. Raise the cat carrier off the floor to elevate the new cat and helps her to feel less vulnerable. 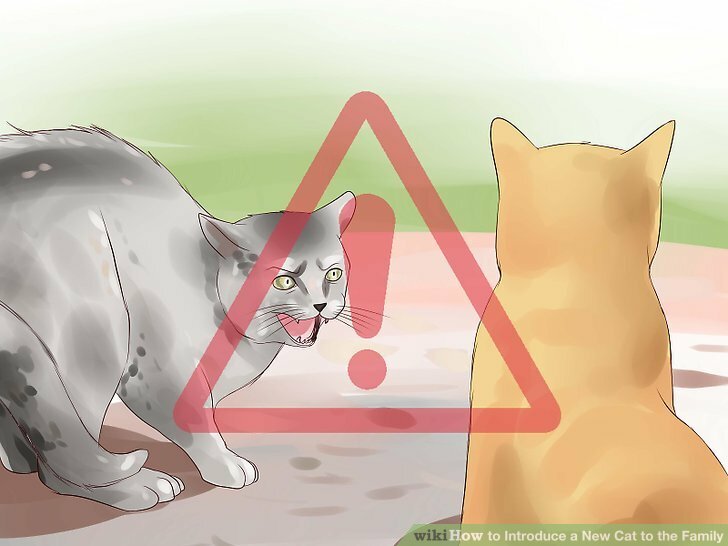 If the new cat or old cats are acting very aggressively, end the meeting. Don’t rush this process. Just separate the cats and try again the next day. If things didn’t go well, make sure to play with each cat separately prior to each meeting so that they are physically tired and less likely to look for a fight. 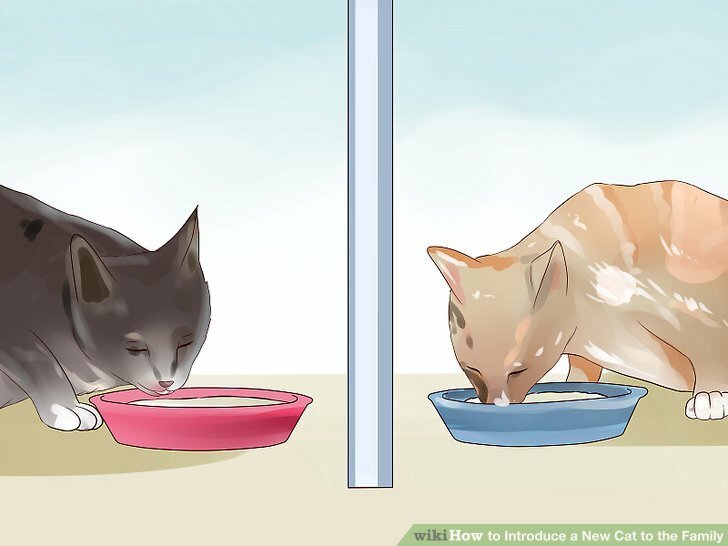 Feed your cats near each other. Consider feeding your cats on either side of a barrier where they can see but not reach each other. A mesh child gate is a good option. You want to engineer meetings without tension so they accept each other’s company without stress. Let the cats spend more time together. 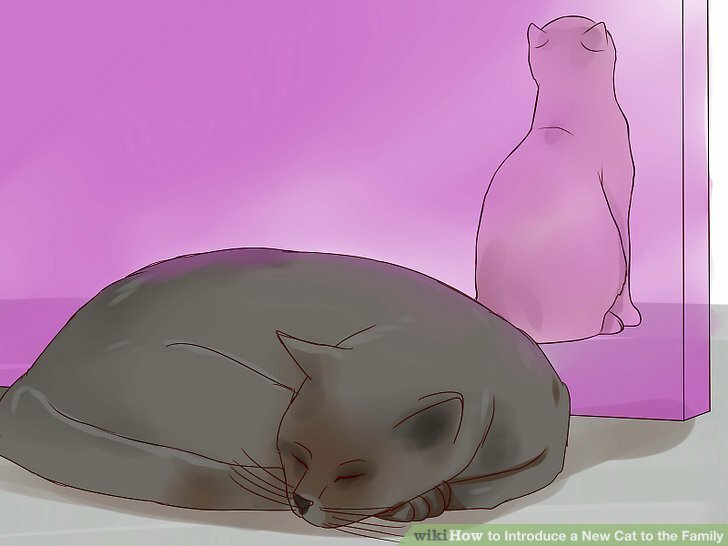 Start giving the cats more time to be together each day as your new cat gets used to the rest of the house. Each day, make sure that the cats like each other more and spend more time together. If things seem to be getting worse, bring your new cat back to the safe room. Make sure that the cats’ time together is happy and calm. When the cats are together, you should feed them, give them treats, play with them, and give them lots of love and attention. They should associate their time together with happiness and fun. Take it one pet at a time. 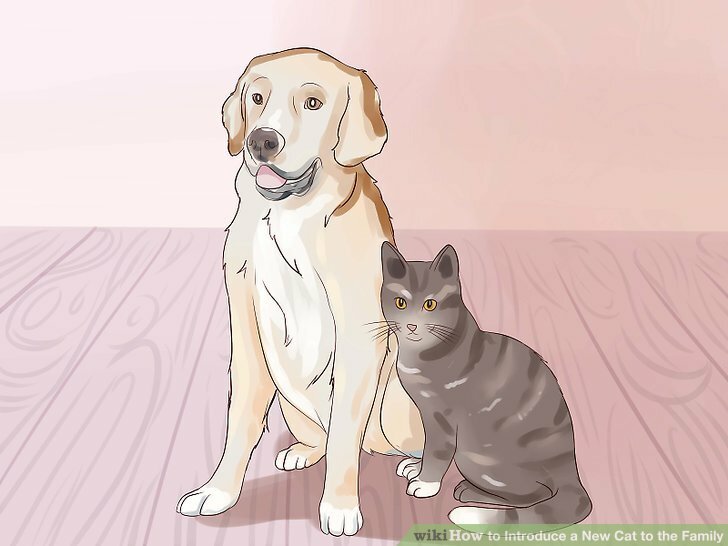 If you have other pets, introduce the new cat to each of the cats first. Take it one pet at a time, and have the new cat adjust to your cats before you bring in the dog. The cat will hear the dog and will know that there’s another pet in the house, but if you introduce the dog first, the cat will be confused and overwhelmed. Know when it’s not working. 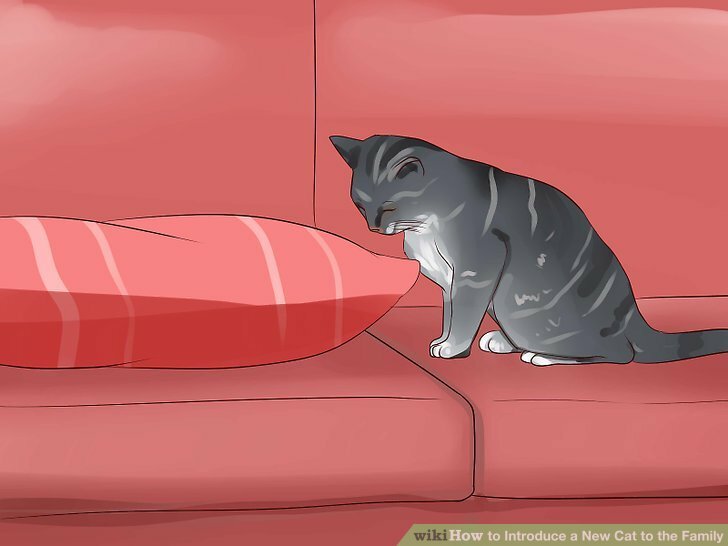 If you’ve tried these techniques for over a month and your cats are not getting along, it’s time to find a new home for your new cat. If the cats are constantly fighting, hissing, and growling, and they can’t be alone together, they never will. Though this will be very disappointing, remember it’s better than living in a home with warring pets, or leaving two cats in a violent environment. You want your new cat to be safe and happy, whether it’s in your home or not. For the weeks leading up to the introduction, work on the dog’s basic training. 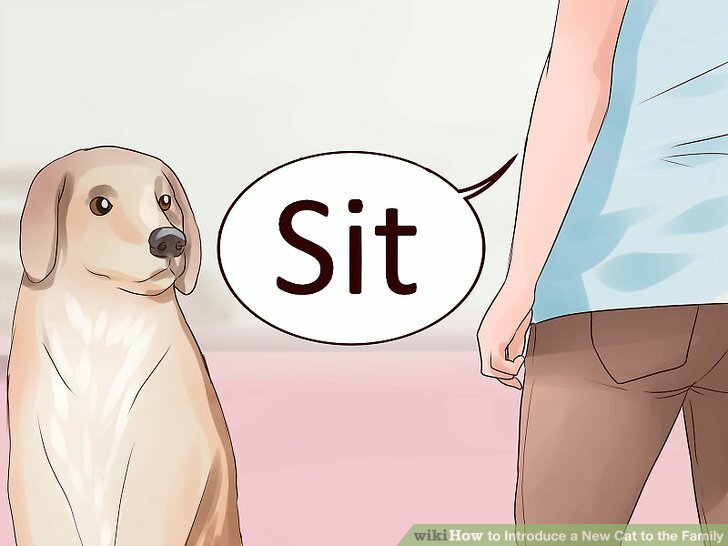 You want him to instantly obey commands such as “Sit” and “Stay”. This way, you have control over the dog if he starts chasing the cat. Separate the cat and dog for at least a week. 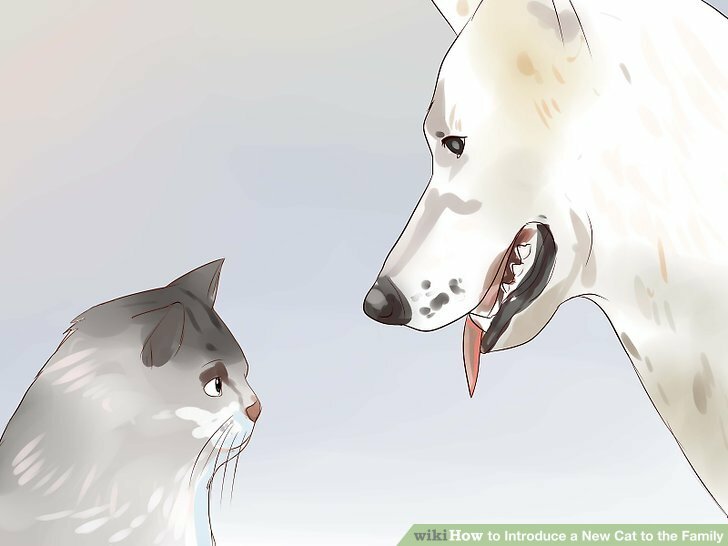 Give the cat time to get used to her new environment before she meets your dog. Once she’s comfortable in her safe room, let your cat and dog get to know each other. 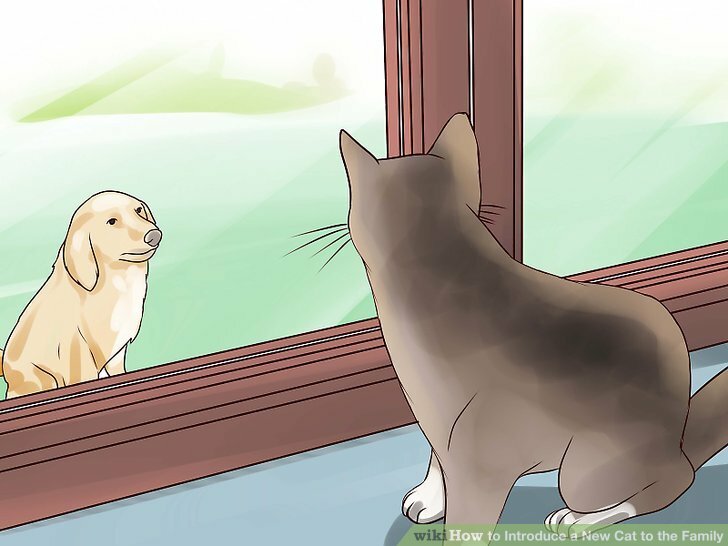 Introduce your cat to your dog. Take the dog for a long walk prior to the meeting so that he is tired when he meets the cat. Keep your dog on a leash when the two pets meet so he is less likely to be aggressive and so your new cat feels less threatened. When the dog and cat are in the same room, reward the dog when he ignores the cat. Tell him what a clever boy he is and keep his attention with treats. 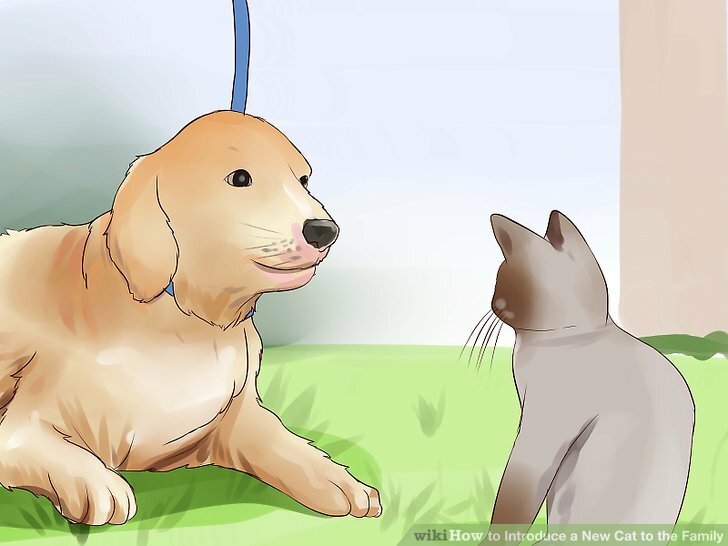 Let him turn to look at the cat but if he starts to growl or show signs chasing such as his hackles rising, tell him to “Sit”, and reward the sit. 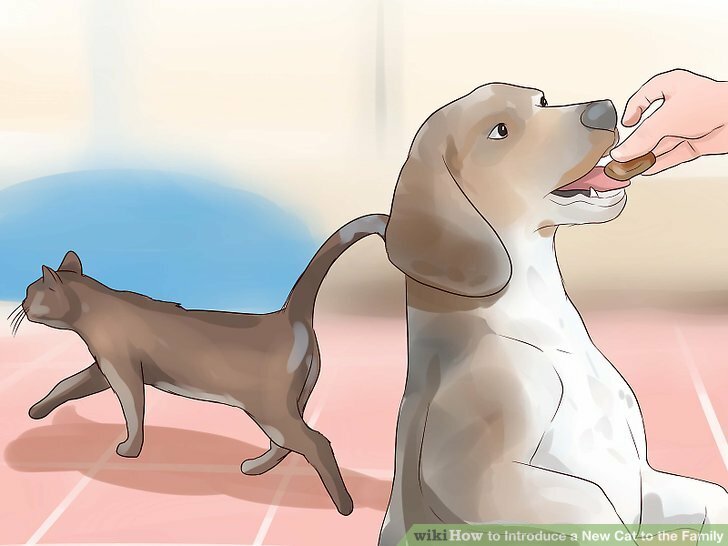 Consider giving the dog an ultra tasty distraction, such as a stuffed Kong, when the cat is in the room. The tasty treat may override his interest in chasing the cat. Also, it teaches the dog to associate the cat with pleasant things such as a treat rather than triggering his predatory behavior. Let the cat approach the dog on her own terms. You can open the safe room and let the cat venture into the environment where the dog is. Let them sniff and circle each other, but always be prepared to act if it gets aggressive. This can take weeks, so be patient and let the cat move at the pace that is right for her. Let them spend more time with each other off leash. Once they get more comfortable and show no aggression, stop using the leash on your dog. However, still monitor their interactions carefully and don’t leave them alone together. If there is any biting, chasing, or aggressive behavior from either pet, break him or her up and call an end to the daily interaction session. Keep monitoring them until you are satisfied that they are used to each other. Don’t leave the dog and cat alone in the same room until you are completely comfortable with their interactions. Be extra careful if you’re introducing a big dog to a tiny kitten.